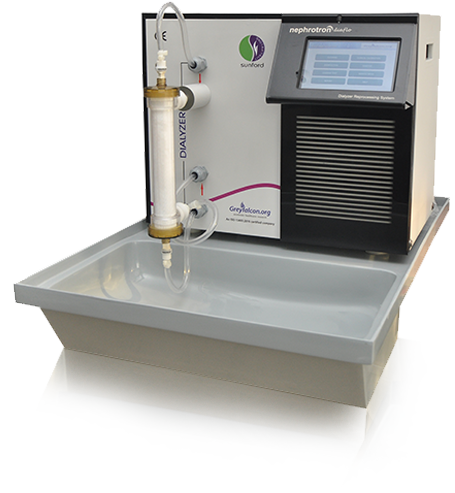 Single station reprocessing of dialyzers - It takes less than nine minutes to reprocess a dialyzer. Both high flux and low flux dialyzers and hemodia-filters can be reprocessed. In built QR Code scanner - If there is a QR label on dialyzer then the inbuilt QR code scanner can be used to capture and record dialyzer data. Accessories - Each system is shipped with a dual unit drip tray, a high definition inbuilt 7 inch AndroidTM tablet, a water pressure gauge to measure water pressure supplied to the system and other accessories like blood port caps, test strips, PVC medical graded tubes for water connections along with user guide for installation and operation.